For many, an analogue synthesizer is defined by its low-pass filter. There have been numerous notable examples of this, including the ARP4023 filter that separated the ‘white face’ Odysseys from their siblings, the Korg35 filter in the early MS20s, the SSM2040 that elevated the first Prophets above their successors, and the ‘matched-pair’ ladder filter that helps the earliest Minimoogs to command such remarkable second-hand prices. Of these, perhaps the most revered (and certainly the most emulated) is the Minimoog filter, and it’s the earliest version of this that forms the basis of the Transistor Ladder Filter in the MiniMod. Like the MiniMod VCO reviewed in the June issue of SOS, the VCF takes the original specification and extends it in interesting ways. But before the company could implement any improvements, they had to get the underlying response right, and that proved trickier than expected. Numerous prototypes were tested before it was discovered that it was necessary to reduce the power supply voltages and signal levels within the filter core to match the Minimoog’s but, once the underlying architecture was in place, it was then possible to add the extra facilities without changing the filter’s character. To recap, the Minimoog’s filter section offered cutoff frequency and emphasis controls, four key-tracking amounts, an ADS(D) contour with an Amount control, and a single modulation input pre-patched to the synth’s modulation section. The AJH goes much further. First, there’s a three-channel audio mixer that accepts signals up to 16V peak-to-peak before clipping, which means that you’re not going to have problems injecting signals from elsewhere. Following this, there’s the filter itself. 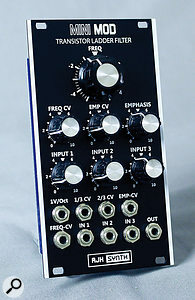 This offers frequency and emphasis knobs, of course, but the cutoff frequency can also be modified by signals presented to four CV inputs: a variable input with a maximum response of around 0.75V/oct, a 1V/oct input, a 1/3 input, and a 2/3 input, the latter two of which can emulate the Minimoog’s keyboard tracking switches. (There’s an error in the manual, which states that these respond at rates of 333mV/oct and 666mV/oct respectively, but that should read 3V/oct and 1.5V/oct.) There’s also voltage control of emphasis, which is always welcome. Finally, there’s an internal jumper that, when removed, roughly doubles the level of the signal within the filter core for a more overdriven sound. Before passing any audio signals through the VCF, I put the MiniMod next to my Minimoog and tested whether their two filters self-oscillated in the same fashion. I was surprised to find that the self-oscillation of the AJH extended to much lower frequencies than that of the Minimoog and, since the reduction of emphasis at low frequencies is an important factor in the Minimoog’s bass sounds, I took some measurements and sent them to AJH Synth. It seems that a faulty capacitor was to blame and, within hours, a replacement was winging its way to me. Inserting this into the MiniMod rack, I repeated the tests and found that all was as it should be. Next, I took the outputs from the three MiniMod VCOs and directed these to both the AJH VCF and the Ext input on the Minimoog. Happily, I was always able to make the two filters respond almost identically. I could also make them sound different (for example, the self-oscillation on the AJH is ‘stronger’ at the highest emphasis values than that of my Minimoog) but that’s not the point — the AJH could sound like the Moog if I wanted it to. I then pushed it beyond the Minimoog’s capabilities. Using an Analogue Systems Sorceror as the source of the numerous CVs, Gates and modulators that I needed, I directed one of the MiniMod’s contour generators to the VCF’s variable input, four 1V/oct outputs from the AS keyboard to the filter’s 1V/oct input as well as to each of the three MiniMod oscillators, the second MiniMod contour to the filter’s 2/3 input, an AS LFO to its 1/3 input for some subtle modulation effects and, finally, an AS contour generator to the Emphasis CV input for some less subtle modulation effects. (Phew!) Despite having nothing more than the MiniMod’s own VCOs, VCF and VCA in the signal path, the range of sounds that I could obtain was superb, ranging from Minimoog leads and basses to classic Moog Modular patches to even more extreme sounds and effects. Oh yes... and passing the sounds through a spring reverb was a revelation. With a little vibrato and portamento, it was 1972 all over again. With so much on its panel, the MiniMod VCF is sometimes a bit fiddly to use, but it retains the company’s standard layout with all of the sockets beneath the knobs, which is sensible. Like the MiniMod VCO, it’s available in black and silver finishes and, as before, I would recommend the black ‘un, which looks a whole lot smarter. 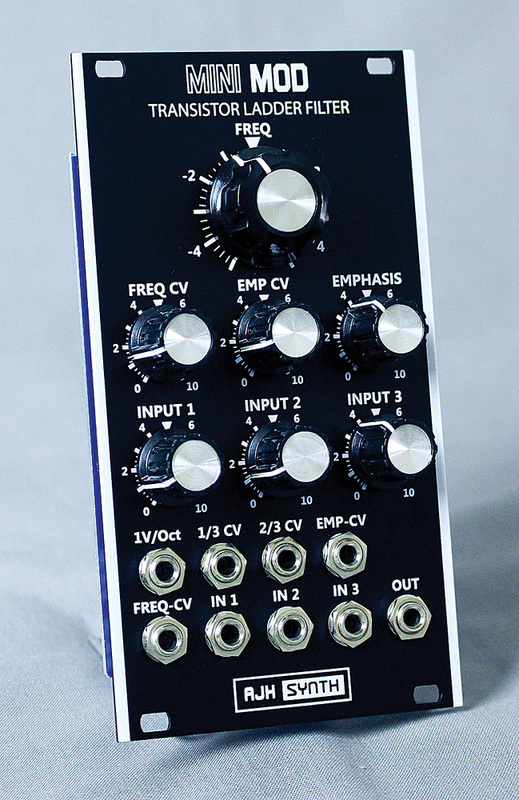 It’s not the cheapest Minimoog-inspired filter you can buy, but it’s far from the most expensive. I like its look and feel, as well as the service provided by the manufacturer. And, of course, it can sound just like a Moog filter, whether used to create euphonic sounds or terrorised shrieks. What’s not to like? Silver fascia £195, Black fascia £210.